These white plastic windows and doors are decorative only. The lighthouses in Plans W2273 and W2274 each use seven (#8607)windows. 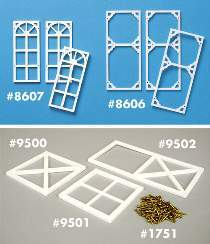 Order 388 mounting pins for #8606 and #8607, and #1751 for #9500, #9501 and #9502 below.